The ads echo the same message -- a coin that's a one-of-a-kind collectible, available right now, to keep forever. But coin experts say that while tribute coins might be pretty, they're not worth much money -- now or ever. Collectors and consumer advocates say the ads dupe those who don't understand the business and rely on emotions instead. The owner of one of the companies that markets them says no one is misled, and people just buy the coins because they like them.One ad for the "$50 Gold Tribute Proof" coin by the National Collector's Mint states that it can now be had for $9.99 (not including shipping and handling.) The tribute coin is "clad in 24 KT Pure Gold" but because the price of gold is booming, the price will only stand for five days. Since the ads have been running for some time, those five days keep getting extended. But the 14 milligrams of gold were worth 61 cents as of Jan. 14. Because they are commemoratives -- not issued by any official government -- their only value is what someone chooses to pay for one. Robert Hoge, the curator of North American Coins and Currency for the American Numismatic Society, said he would not consider the As Seen on TV items to be coins. "Those so-called Buffalo gold pieces are evidently simply conniving promotions intended for marketing to unwary, uninformed would-be buyers," he said. 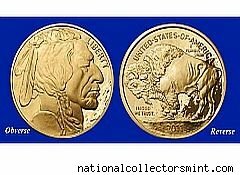 In 2001, the U.S. Mint put out a release, warning consumers about a silver Buffalo coin produced by National Collector's Mint, the same company producing the gold coin. Many people had purchased the replica, but believed they were buying the real thing. In 2004, then New York Attorney General Elliot Spitzer sued the company, which had to pay more than $2 million in refunds and penalties over deceptive advertising used to sell the World Trade Center commemorative "Freedom Tower Silver Dollar." Avram C. Freedberg, president of the National Collector's Mint, refused multiple requests for a phone interview. "Since most media do not focus on the over $2 million we have donated to 9/11 charities or how creative our commemoratives are, or how beautiful and affordable our coin tributes are, we try to supply facts, rather than give interviews," he told Consumer Ally by email. In response to email questions, he said that the prices are reflective of the goods and volume. "People value them because of their beauty and because of the rarity of the original or because they cannot afford the original," he wrote. Dave Harper, editor of Coin Digest, said it would be better to call them "souvenirs" or "mementos" rather than collectibles. "If you are looking to make money, I would advise not to buy them," he said. Even U.S. Mint commemoratives are not considered rare and unique, said Harper, because they are available to everyone. Freedberg said they could be collectibles to some. They've seen their products sold on eBay for "multiples" of the original price, he said.